Looking for a healthy, hardy, tasty, filling soup? Well if you aren’t, you should be! 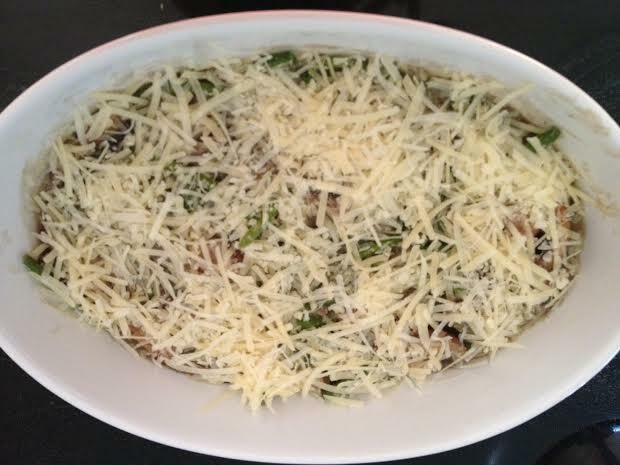 This is a great recipe that you can dress up as a casserole if need be! Mushrooms are an overlooked ingredient that are incredibly good for us. They are cancer preventers, they are high in vitamin D, and there are studies that have shown substituting mushrooms for various foods (like red meat) result in significant weight loss. Sauté chopped onion in butter and oil, then add chopped mushrooms. 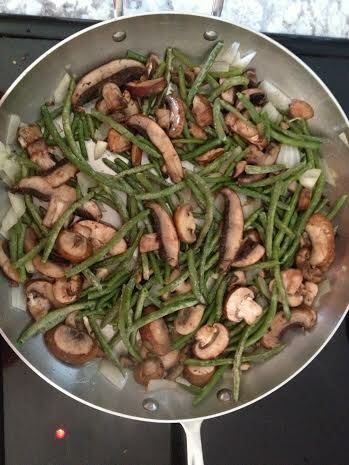 Cook until soft then add green beans, water, salt and pepper. Cook another 2-3 minutes. 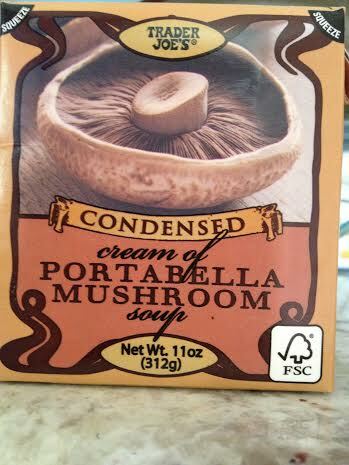 Pour in mushroom soup (I used Trader Joe’s condensed portabella) and letter simmer for ~ 5 minutes. Pour soup in to casserole dish and cover with the greatest gift to mankind: Cheese. I used Parmesan, but you use what feels right. Bake in oven for ~ 20 minutes (until top is golden brown) at 375 degrees. Let cool. Enjoy. Cheese is a great gift! Mmmm! But no matter what kind of cheese I try (sheep, goat, cow) I just can’t seem to tolerate dairy. So disappointing! This looks delicious. You can always leave off the cheese! I find when I ingest dairy made from grass-fed animals not treated with hormones, I’m ok. Unless I’m eating a lot of clean dairy (then I get phlem-y) But everyone is biologically unique. I can’t tolerate a lot of meat, no matter how ‘clean’. So my recipes aren’t meat focused. You can add or subtract ingredients to make them your own. Thanks for your remarks!